This entry was posted in on November 20, 2017 . 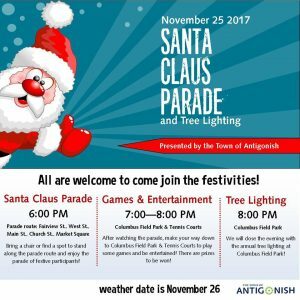 Don’t miss the Santa Claus Parade and tree lighting this weekend, presented by the Town of Antigonish! All are welcome to come join the festivities. The Santa Claus Parade is Saturday evening at 6 p.m. leaving from Fairview Street, down West Street to Main, and up to Church Street to Antigonish Market Square. There will be games and entertainment at Columbus Field from 7 to 8 p.m., followed by the tree lighting at Columbus Field at 8 p.m. Weather date is November 26. Celebrate the season this weekend with the Town of Antigonish!